so said ellie: My commitment to you. Hi there. Me again. I've a commitment to make. A commitment to you. If you're still there, that is. It's August. I guess you knew that. Unless you live in a cave under the sea. And then even then, I would expect that you knew the month. Although, I suppose, if you were under the sea and it was dark and you had no internet access, you wouldn't really know what was going on above. Good thing that friendly dolphins would probably help you out. Umm. Yes. August. Sweet Jesus, how did that happen!? And I've nothing to show for it. Two posts in July. TWO. Whooft, where is the commitment to you, my reader? This month (although, I admit, it has already started) I am going to write you a story three times weekly. I cannot make promises about the humour or the quality to be contained in these posts, but my endeavour is to reconnect with the world. The online world, where the people are imaginary and the human contact is negligible. Three posts a week, starting tonight. Do you think that as a reward at least ONE of you might leave a comment on one of my posts? I KNOW YOU ARE THERE (in a non-insane way...obviously). 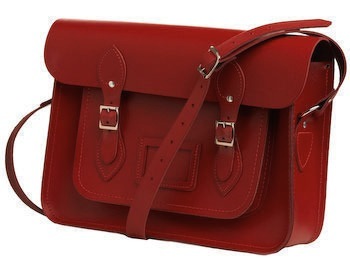 It is the Cambridge Leather Satchel, and it is my desire to own one. Unfortunately, I am unable to own one for two reasons: the first, I am unsure of the colour I actually desire (much like my KitchenAid dilemma); second, I was in Melbourne for work in July, and mergers and acquisitions came to the fore. The accounts department is still trying to reconcile the actions of those three days.